On the walls of the office were a painting of a Cuban revolutionary, signed photographs from Presidents of the United States, and stained glass from the street in front of Sixteenth Street Baptist Church in Birmingham, Alabama. Dean Lewis, long-serving director of the PC(USA) Advisory Committee on Church and Society, was talking to me about his work with the Presbyterian churches of Cuba -- "Much of what we did was done with the active resistance of the Louisville system" -- but he could have been speaking of almost any episode in a long career of supporting the church in its work of witness. It was Thursday morning. I had flown in the night before, driven through snow from Albuquerque to Santa Fe, and loaded a rental car with acid-free boxes and other packing supplies. Now I drove north out of Santa Fe into Rio Arriba County, to the neighborhood of Rio Chama, which Dean and Marianne Lewis have called home for more than two decades, patching up an "adobe ruin" in a plot bounded by 300-year-old cottonwood trees. 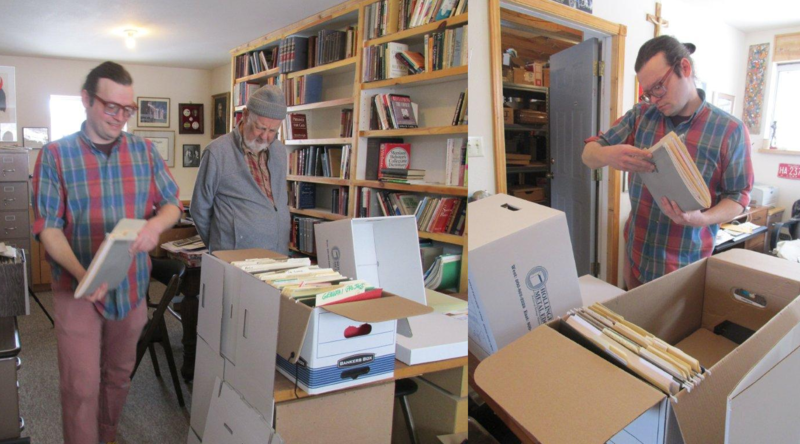 I was there on a rapid trip to appraise, describe, pack, and ship Dean's personal papers to PHS, with the support of the Lewises and the Presbytery of Santa Fe. We began with Cuba. In the 1990s Dean conducted research at the Presbyterian Historical Society to support the pensions claims of Cuban Presbyterian ministers. The Presbytery of Cuba was organized in 1905, and its ministers were enrolled in the pensions plan of the Presbyterian Church in the U.S.A. The U.S. embargo of Cuba obstructed pensions payments to retired members of the plan. The 1996 General Assembly directed the Board of Pensions to convey back payments to the Cuban ministers. Dean also organized the Presbyterian Cuba Connection, a mission network with the Iglesia Presbiteriana-Reformada en Cuba. The PCC celebrated with the IPRC in 1998, during the first open-air religious service in Cuba since the Revolution; they celebrated again in 2000 for the millennium. The PCC sponsored visits by Cuban church leaders to the United States over the past two decades, and PCC members were in Cuba during President Barack Obama's first visit there in 2016. From the Cuba-related records at the Lewis's, I packed nine boxes for shipment to PHS. Dean was born in 1926 in Tulsa, Oklahoma, and raised in Missouri. He was ordained by the Presbytery of Fort Smith (Ark.) in 1953. As pastor of First Presbyterian Church (Springdale, Ark.) Dean helped organize Arkansas Citizens for Orderly Compliance, which advocated for immediate desegregation of Arkansas' schools and civic life. He joined the national missions staff of the UPCUSA in 1958, settling in Philadelphia in 1960. In 1963, he was a member of the UPCUSA response team to Birmingham, Ala., in the wake of the Sixteenth Street Baptist Church bombing. In 1966, Dean led Project Free, which sought to end racist real estate and housing practices in Philadelphia's Main Line communities. His picket sign is still on the wall. Most things Presbyterian in New Mexico flow through Ghost Ranch in Abiquiu, and Dean's life is no different. 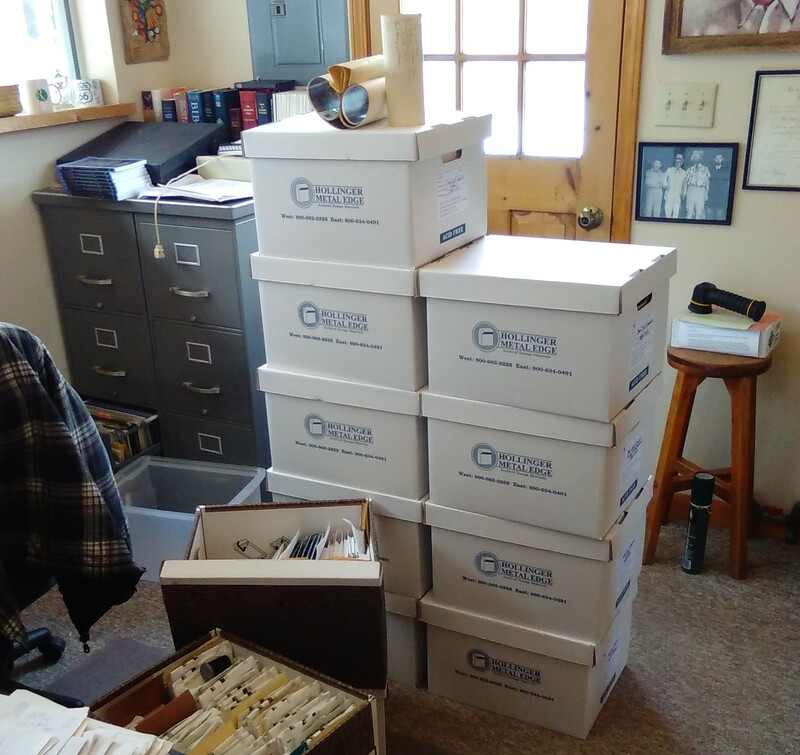 Among the personal records we packed were color slides of a 1959 trip to Ghost Ranch, and open-reel audio tapes of a 1969 consultation between the UPCUSA Committee on Church and Race and the Presbyterian Lay Committee. In retirement, Dean served as volunteer program director at Ghost Ranch. Marianne enthusiastically suggested that we break for an hour and a half to take a drive around Abiquiu, but I had to beg off. By then, I'd packed a total of twenty-two boxes. "There are records of an ACCS consultation on cosmology in 1987," Dean said. Why did you do that, Marianne and I asked. "Because I was curious." By then it was 5:30 pm. With the sun setting in Rio Chama, I followed Dean and Marianne's pickup truck into Medanales for dinner, and drove back to Santa Fe. Updated box tally: twenty-five. Too infrequently do archivists get the chance to work with the people who make personal records in real time; appraising and describing records with Dean and Marianne alongside me was an invaluable experience. When I encountered an unfamiliar name or acronym, I could get the full context directly from the creator, so that even my cursory, box-level description is far richer than it otherwise would have been. The experience was also an emotional one. Marianne reminded me several times that the records I was rifling through, boxing, and tagging weren't just a surrogate of Dean's work; what we were boxing up was Dean's life. Work with personal papers is ghoulish: we separate parts from the body of records, we alienate them from their home, we seal them up, and we justify this only by pointing to the greater good that records in a house of research can provide, that they can one day help people younger than us do the work of telling truth and reconciling people with each other. The next morning I shipped the first five boxes of Dean's records from a UPS store in Santa Fe, and drove back to Dean and Marianne's to pack the very last material into the SUV. By noon I was back at the Guadalupe UPS unloading twenty-five more 30-pound boxes for shipment. Our next stop was up Hyde Park Road to the home of Mary Ann Lundy, who had gathered records of the church-wide response to the 1993 Re-Imagining Conference. 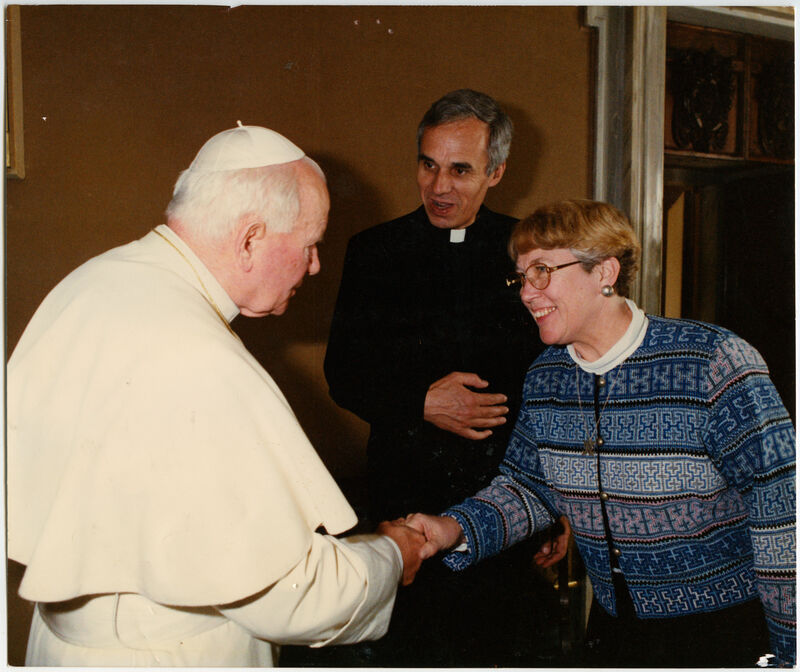 Mary Ann had been director of the PC(USA) Women's Ministry Unit for seven years when a campaign of character assassination following in the wake of the 1993 feminist theology conference led to her ouster. As with Dean, I urged Mary Ann to speak while I sorted papers, and our description of the thirty-four boxes I packed is all the richer for it. By 4pm I was on the road to Albuquerque, with Mary Ann's papers and my supplies in the back of the vehicle. Our generous partners in the Presbytery of Santa Fe gave us time before their presbytery meeting to deliver a workshop on record-keeping. I spoke at Covenant Presbyterian Church with clerks of session and other interested parties, including volunteers from the Menaul Historical Library, until about 9:30. 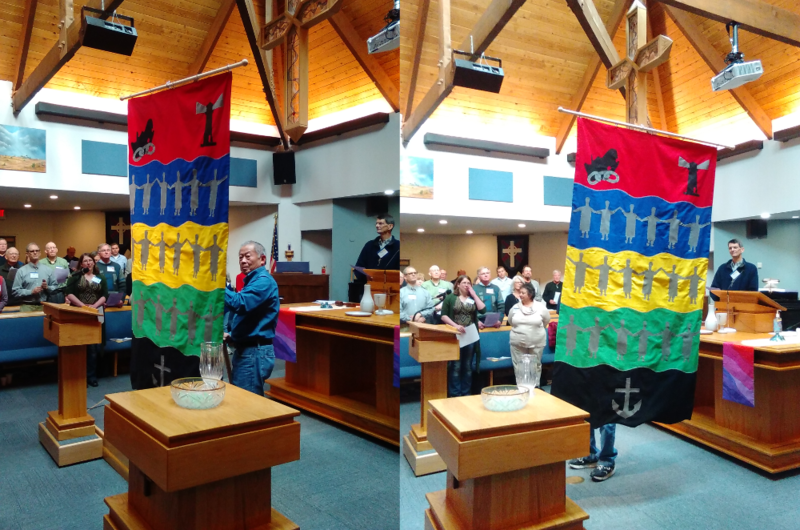 I had five minutes on the floor of presbytery the next morning, and I got to see the Presbytery's new design for a banner commemorating the Belhar Confession. By 2 pm I had sent the last of our New Mexico records off from an Albuquerque UPS, and was ready to soak in a bath and watch college basketball on my hotel room tv. New Mexico contains a dense network of Presbyterians who've served national agencies and ecumenical bodies, taught at schools and seminaries, and served as mission workers. They have sheltered people in migration, been under house arrest, been expelled by national governments, and worked for civil rights and religious liberty. I was asked when I came home to Philadelphia about the awesome landscape of New Mexico. What most holds me in awe about the state is not some high-desert vista, but its humanity. 14 hours 2 sec ago. Today’s #HistoricalFigureFriday honors Reverend James Patriot Wilson. Born in 1769 in Lewes, Delaware Wilson went on to graduate from the University of Pennsylvania in 1788. He initially studied law and was admitted to the Bar but the unexpected death of both his wife and brother led him to a religious path. He was ordained as pastor of the Presbyterian Church in Lewes in 1804 and in 1806 he accepted a call to lead the First Presbyterian Church in Philadelphia. He resigned as a much celebrated pastor in the spring of 1830 before he died December 9th 1830. Our portrait of Reverend Wilson was painted in 1807 by none other than James Peale the younger brother of Charles Willson Peale. This oil on canvas painting represents one of the many large portraits James Peale completed after he shifted away from miniatures. To see more works by James Peale visit PAFA The Pennsylvania Academy of the Fine Arts or the Philadelphia Museum of Art.